Wiener Dog Races, Tacos, and Lightening Playoffs. RiverFest ! The 4th Annual Riverfest mixed a Cinco de Mayo party, Weiner Dog Races, and The Lightning playoffs. Wow! 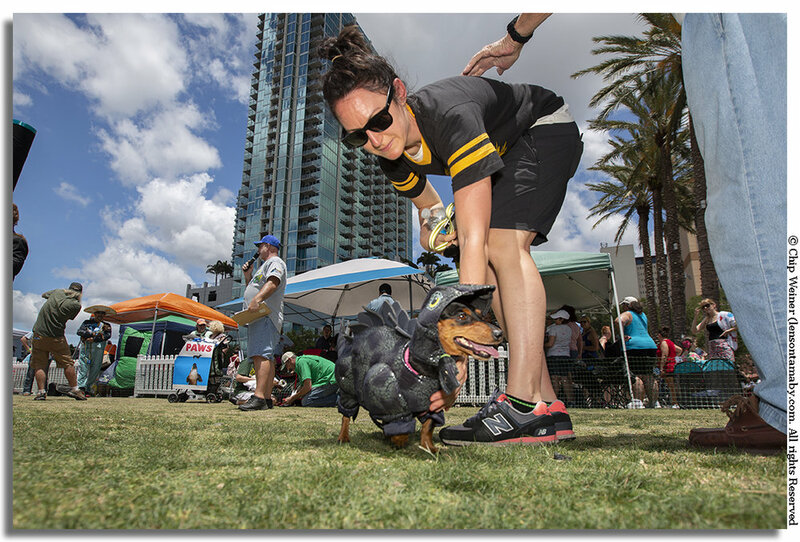 Riverfest: Wiener Dog Races, Tacos, and Lightening Playoffs. What do you get when you mix Cinco de Mayo, major league hockey playoffs, and an annual party anchored at Curtis Hixon Park in downtown Tampa? Riverfest! This year's celebration covered the 2.3 miles of Tampa's Riverwalk including the new addition at the east end, Armature Works. The two day event started off with a watch party and then celebration of a Lightning win over the Bruins in overtime in the fourth game of the hockey playoffs on Friday night. The excitement grew from there! Saturday brought events throughout the Riverwalk, Tampa's premier waterfront foot and biking path. Here's what it looked like through the lens. Saturday's activities kicked off with a paddle board race from Waterworks Park out to the turnaround in front of the Tampa Convention Center. According to organizers there were between 150 and 175 racers participating in a 1K fun race, 5K recreational class, and a 10K elite class race. Folks who didn't have a paddle board could rent one at the park. The name of the race may be a little misleading because it wasn't just for stand up paddle boards. There were kayaks, canoes, and participants who race in the prone position (kneeling, using only their hands to propel). Bubba Ellis is an animal. The 63-year-old raced in the elite division in the 10K, prone! That's the 6.2 miles- two laps of the course- on his knees using only his hands (no paddles) for propulsion. He used to race standing with paddles, but after an injury began to race prone. Bubba Ellis, an elite paddler, completes the 10k prone position race. Thats 6.2 miles kneeling on a paddleboard at 63 years old. Animal! What's not to like? They're WIENER DOGS! There were races, costume contests, and a kissing competition. It's hard to say which was more fun to watch, the dogs or the owners. Riverfest fell on Cinco de Mayo this year so it made perfect sense to pump up the party with a taco festival. Being a foodie I couldn't wait. I had visions of events like the Mac and Cheese Throwdown where talented chefs put forth their best dishes. Taco Festival guests were invited to either buy a wristband for $10 for three tacos, or $15 for 5 tacos. Unfortunately the food wasn't very good. Organizers had one caterer who opened 10 different stations giving eaters several choices of ingredients. Given all of the food talent in the area, this could have been much better! It was a great idea but could have been better executed. Tampa Riverfest Taco Festival taco tent was a good idea in light of Cinco de Mayo, it just wasn't very well executed. Tampa is a foodie destination. We can do better! This was the Cumin Beef Taco- beef with roasted garlic, onion, and cilantro. It was bland except for the very salty beef. That's $3.33 worth! The Key West pink shrimp taco wasn't much better. I didn't wait in line for a third taco. In Tampa we don't frequently get to see how talented music students and teachers are. Unless you are a parent with a kid in public school, rarely do we get to experience such remarkable youthful know-how. All day long Hillsborough County elementary schools presented Music Mayhem, a showcase of music programs at MacDill Park. There were a lot of oooo's and ahhhh's because they are so dang cute But seriously, it was quite entertaining! Carrollwood Elementary's group named Alien Nation Orff plays at MacDill Park, one of the twelve Hillsborough School groups scheduled to play. What's a festival without great music? Throughout the day there were several musical acts stretching out all along the riverfront. 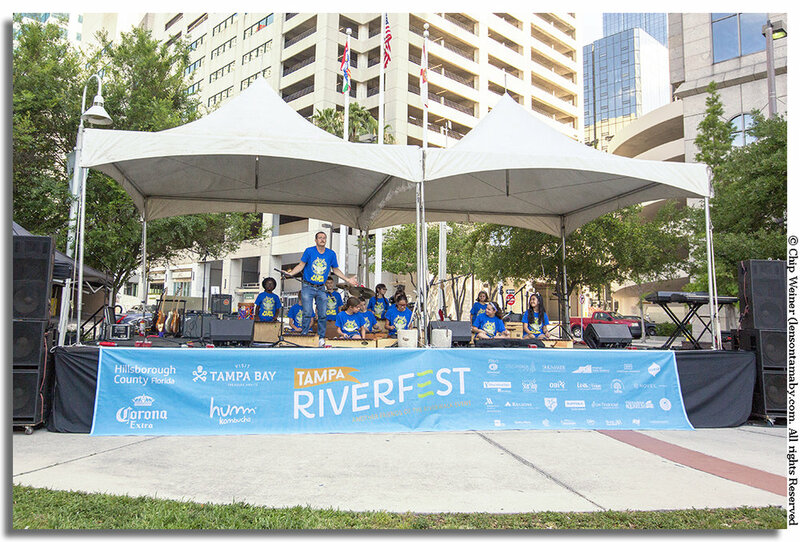 Friends of the Riverwalk, organizers of the event, are to be commended on the caliber of talent of the groups who performed at Curtis Hixon. Well done! 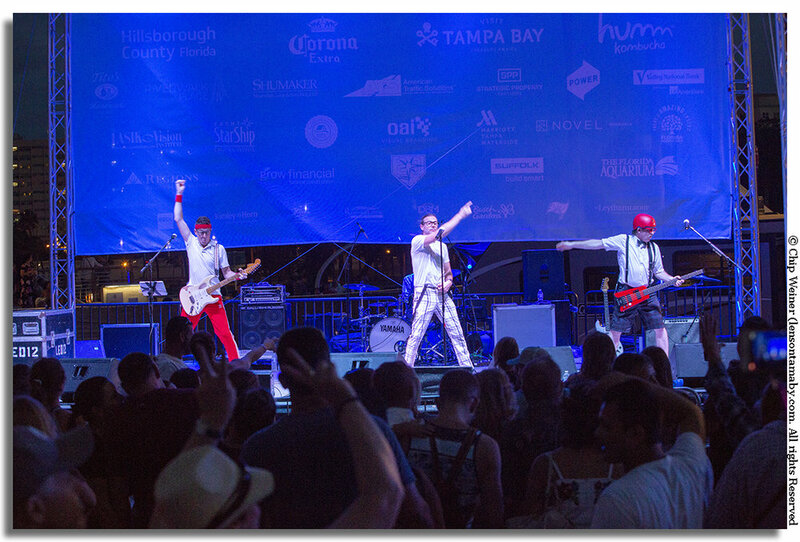 Curtis Hixon Park was aglow from The Spazmatics, who wrapped up a daylong music feast at Curtis Hixon Park. Ulele hosted the Stewart Tussing Band on their Sunset Lawn. The act is a throwback to the 70s and 80s in Tampa when the group performed in many venues in the bay area. They now reside in Nashville. The show was briefly interrupted by rain shower, but resumed thereafter. Capping off the festival The Spazmatics, a remarkably talented cover band, killed it! Forrest Hoffar and the Feels are partially obscured by trees as they play on the lawn at Armature Works. These guys stood out in the sun for hours entertaining. Come on Armature Works, help some brothers out! Along with some brief periods of rain sending Riverfesters scrambling for cover, a fairly consistent breeze kicked up in the evening grounding the scheduled hot air balloon launch. Historically balloon glows in downtown Tampa have the aircraft tethered to the ground but rising several feet up with their gas fires illuminating the balloon creating a spectacular site with Tampa's beautiful downtown in the background. On Saturday night, even though the crafts were grounded, pilots still thrilled the crowd by gassing the burners. It was a pretty tight sight! Even though their aircraft were grounded, pilots of hot air balloons gassed the burners creating a dramatic site (and some fairly intense heat). Check out the Lightning logo on the Rivergate building! 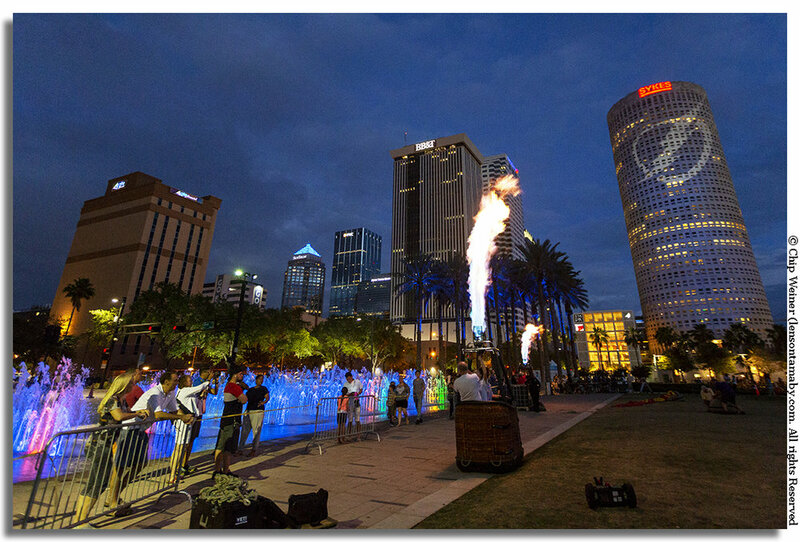 The weather was awesome, Curtis Hixon Park was beautiful, and the fourth annual Tampa Riverfest was a success! See you next year! For information on other Tampa photography classes and lessons, digital photography classes, and Tampa photography workshops feel free to call me or look under the Tampa Photography Classes section. I also give private individual photography lessons on camera operation and making better photographs and would love to work with you one on one to make you a better photographer. Let's talk about what you need! 813-786-7780. See you in class!